This recipe is very high in fiber which makes the amount of total carbohydrates high. Since fiber is digested differently than the typical carbohydrates that come from grains, wheat, and beans, eating a diet high in fiber has been linked to weight loss, lower cholesterol, and a decreased risk of cardiovascular disease and stroke. If you need to decrease the fiber, omit the broccoli and cauliflower since they contain more fiber than water based vegetables such as zucchini and peppers. *Note: tomato sauce can be loaded with added sugar and sodium so look for varieties that have about 50 calories, less than 5g of sugar, and less than 500mg of sodium per 1/2 cup serving. (I use Whole Foods 365 brand Classic Marinara). In a large bowl, combine red pepper, zucchini, broccoli, cauliflower, asparagus, 1 cup sliced mushrooms, and eggplant. Spray vegetables lightly with cooking spray and toss with herbs. Place in oven and roast for 25 minutes, stirring halfway through. Meanwhile, lightly spray a large skillet with cooking spray. Add onion and garlic and saute over medium heat until onions are translucent (about 3 minutes). Add 1 cup diced mushrooms and cook an additional 5 minutes. *If mixture is sticking to pan, add 1 tbsp of water at a time until mushrooms are tender. When onions, garlic, and mushrooms are tender, transfer to a plate/bowl and set aside. Lightly coat the same skillet with cooking spray. Add meat over medium heat until cooked through. Stir continuously to avoid burning. Once cooked, add mushroom/garlic/onion mixture back to skillet and cook an additional 2-3 minutes. Add tomato sauce and simmer over low heat. 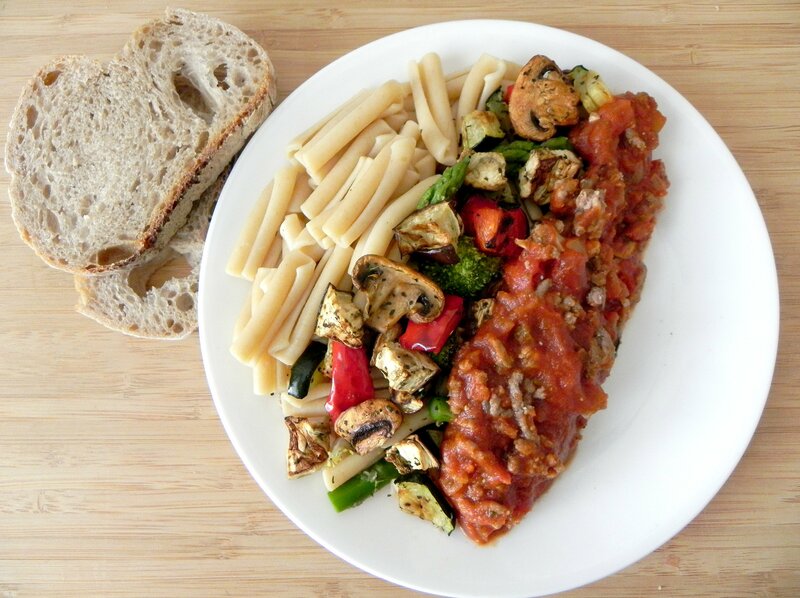 To prepare, divide pasta topped with vegetables among two plates or bowls and top each plate with half of meat sauce. Serve alongside a fresh green salad if desired.